Okay, I think I finally have myself organized enough to post about my last two days of BEA. If you missed them, check out my posts about days one and two as well. 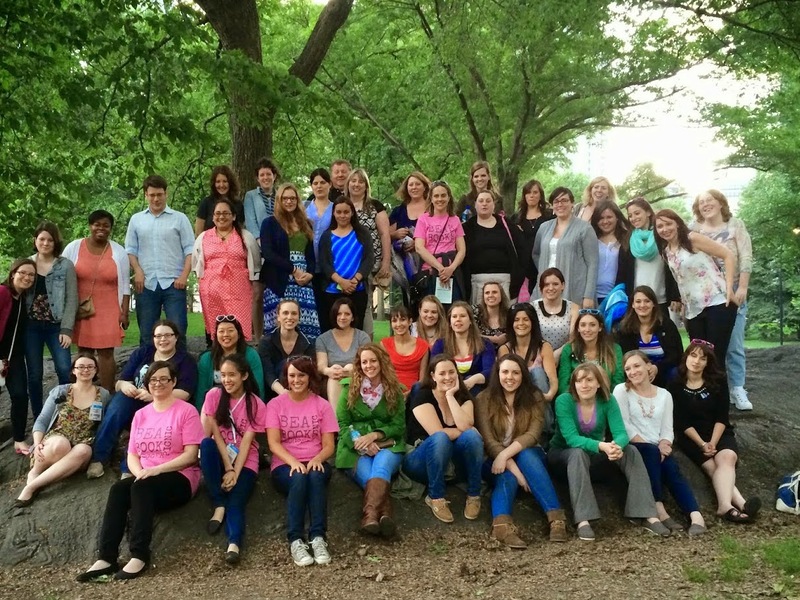 I met LOTS of new blogger friends and awesome authors!! First off, here's my book haul. 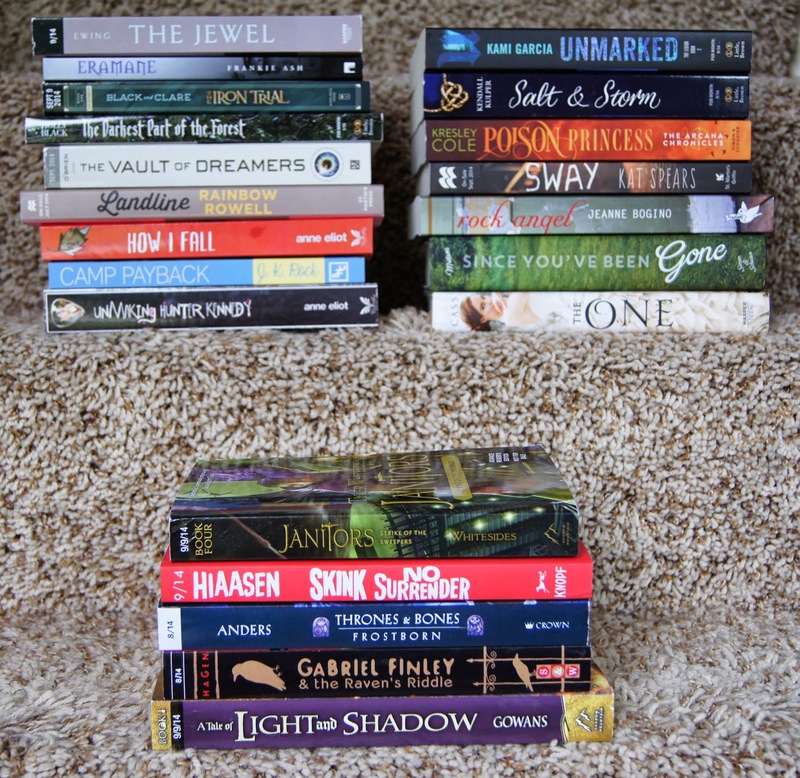 I already showed you the books that I got on day one from the Bloggers conference. Here's everything else I got!! 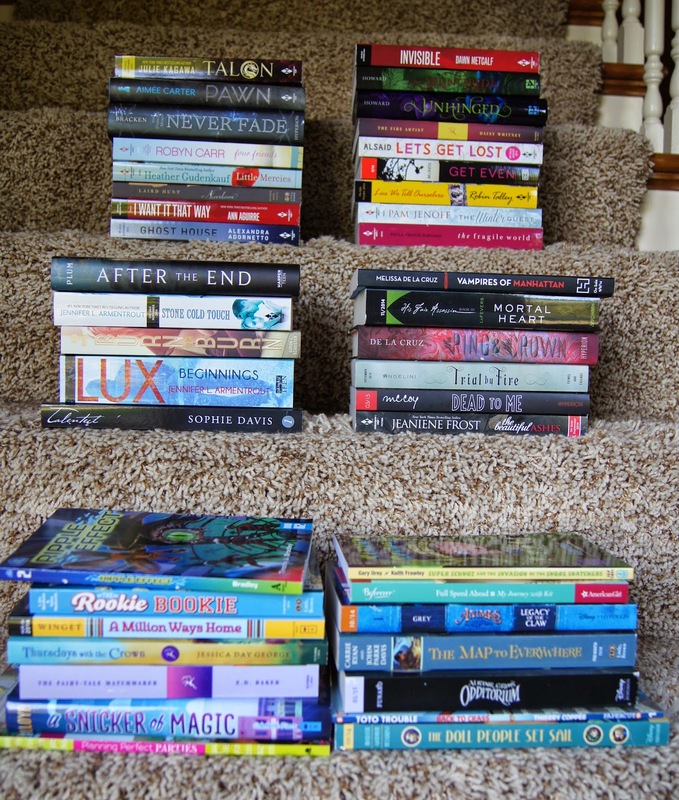 I ended up with a total of 53 Adult/YA books and 20 Middle Grade books (my kids love me right now!). That should keep me busy for a while! A few of these will be coming to you, my lovely readers, in an upcoming giveaway. So keep an eye out for that post! In the morning on day two, I went to the Adult Authors Breakfast, where the highlight was hearing Neil Patrick Harris talk about his autobiography - which he wrote Choose Your Own Adventure style (check it out in the box above). How hysterical is that? 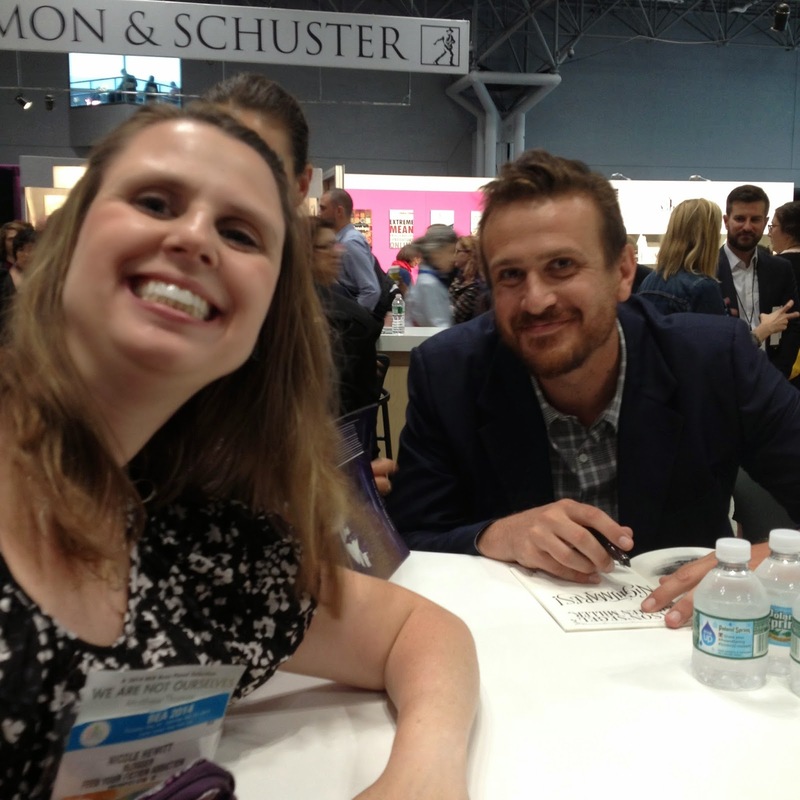 On day three, I went to the Children's Authors Breakfast and absolutely fell in love with Jason Segel. He is just completely adorable and delightful in person! He talked about his childhood nightmares, which inspired his Middle Grade book (Nightmares!) - he had a terrifying recurring nightmare about a witch who wanted to eat his toes. Yep. Really. He also made several hilarious references to the fact that he's a thirty-something guy who loves puppets. (Remember that puppet scene at the end of Sarah Marshall? He says the producers just gave him a blank stare, shrugged and said, "It's your movie.") But my absolute favorite thing about him? He said that he wore a cape under his clothes until he was 13 years old - Just in case. The line for the Jason Segel signing was an absolute mess, but I'm leaving that for a future post (What I Can Only Hope the BEA Organizers Learned from BEA 2014). So, much of days three and four (like day two) was spent in line, waiting to meet my favorite authors. I got to meet quite a few over the four days that I was in New York. 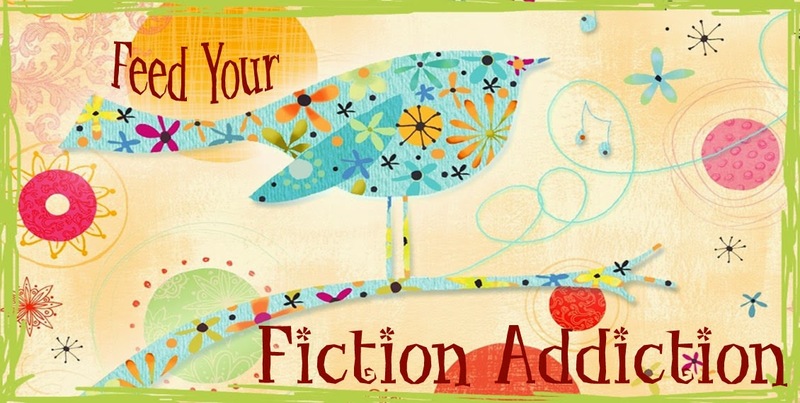 Some of my favorites were: Julie Kagawa, Jennifer L. Armentrout, Dawn Metcalf, Jason Segel, Keira Cass, Alexandra Bracken, Kresley Cole and A.G. Howard. Giselle from XPresso Reads, Rebekka from Endlessly Bookish and Micheline from Lunar Rainbows at McGee's. My adorable Irish roommate - Jenni from Live to Read, Love to Read, who I'm so glad I got to know! She cracked me up when she would frantically go through her books each night, trying to decide which ones she might be able to do without, since she couldn't ship them home to Ireland (there were very few she couldn't do without!) Oh, and her horror at mosquitos was also quite amusing (I had no idea there were no mosquitos in Ireland!). Malissa from Reads All the Books, who amazed me with her super-organizational skills. Seriously, she had a binder with tabs, a color-coded schedule and sticky notes galore. I was in awe and stuck with her most of the first day. After all, she knew what she was doing! Plus, she was super sweet! Jessica from Lovin' Los Libros, who I sat in line with for 1.5 hours on day one to get Talon (along with Malissa and several others). I then ran into her many more times throughout the conference and stopped to chat. She was usually surrounded by other friendly bloggers like CeCe from CeCe Reads, Chelsea from Starbucks & Books Obsession, Tonyalee from Lilybloombooks, and Wendy from Book Scents, so one blogger friend turned into many! Octavia from Read. Sleep. Repeat. and Nikki from There Were Books Involved, who were nice enough to help me figure out the best way to go about shipping books! Danielle from Love At First Page, Steph from No BS Book Reviews, Kim at Kimberly Faye Reads and Megan from The Book Asylum. 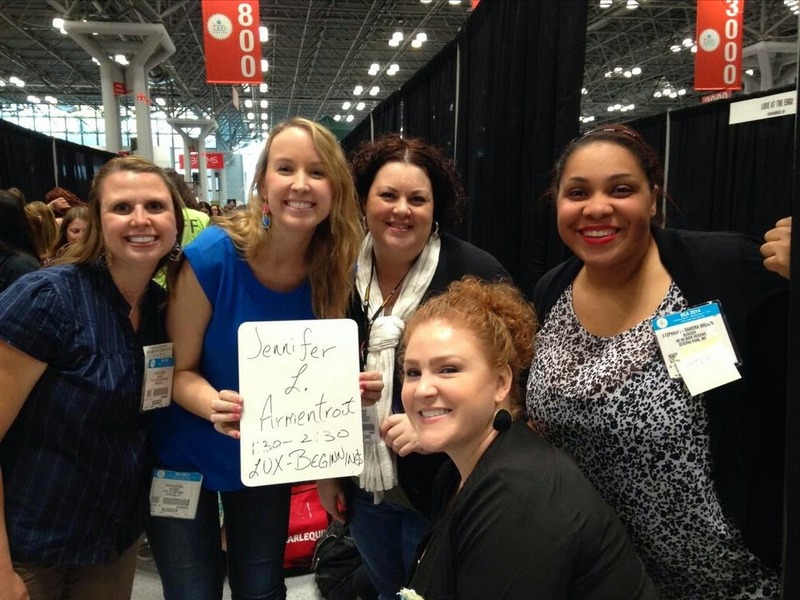 When the BEA staffer told us there was no line started for Jennifer L. Armentrout, Danielle and Steph didn't take no for an answer - they insisted that she let us start one! The BEA staff member's response: "Is she popular?" Had to laugh! Luckily, she gave in and let us hold the coveted beginning-of-the-line sign. (Pic above is thanks to Danielle). Steph from The Fake Steph, Jessica from Jessie Marie Reads, Jen from A Book and a Latte and Andrea of The Overstuffed Bookcase, who all sat at my table at the BEA Bloggers conference. Debbie from Snuggling on the Sofa, who is a super sweet British blogger who I stood in line with for quite some time and who said hello every time we crossed paths from there on out. Tiff from Mostly YA Lit and Braiden from Book Probe, who convinced me that I absolutely had to go see If/Then on Broadway (and Wendy, CeCe and Chelsey did even more convincing the next day). Braiden told me about the lottery for tickets, and even though I didn't manage to get a $25 lottery ticket for the show, I did get a $50 lottery loser ticket. $50 for fantastic seats to see Idina Menzel!! The show was absolutely amazing!! And since the crowds at Saturday's BookCon were INSANE, I was extremely happy to escape The Javits Center and head out to see a show! 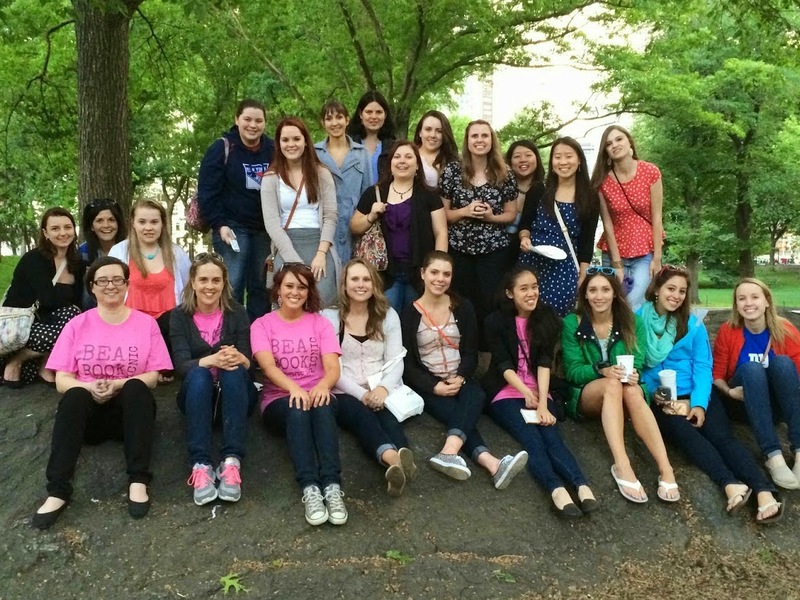 At least thirty other bloggers who I hung out in line with or ran into at the picnic and exchanged cards with!!!! I wish I could write something specific about them all, but my post would be ten pages long. One more person I want to mention is an author named Isabel Bandeira. I stood in line with her for a long time on day two and then again for a while on day three (I don't remember for what anymore!) and she is just the sweetest person ever! She has a book that's going to be published in 2015 called Bookishly Ever After, so I want you all to go mark it as To-Read on Goodreads. Right now - go on! 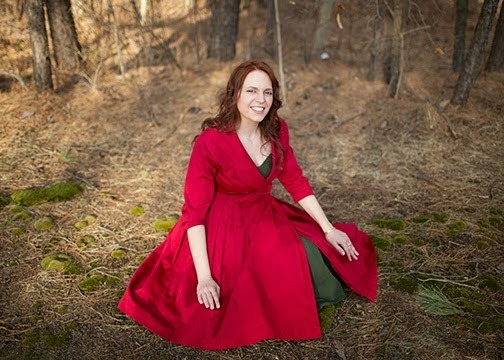 It sounds like an adorable YA contemporary read. And I absolutely loved Isabel. so I want everyone to read her book!! She deserves lots of success! Oh. My. Goodness. This has felt like a marathon post and I honestly feel like I could probably write forever about all of the awesome experiences that I had at BEA. Was it exhausting? Yes. But AMAZING!! If you weren't there and you ever have the chance to go, I would definitely jump at it. I'm not sure if I'll make it again next year (though I'd LOVE to - just have to talk my husband into it, since it's not cheap once everything's said and done), but I will definitely be there in 2016 when it comes to Chicago - my turf! Yay!! Now I just need to get reading!! Did you think about choosing the most recommended Bitcoin exchange company - YoBit.